Ok, So two weeks ago I somehow managed to get a 4 day weekend. I decided to work on my garage (see my latest project posting. 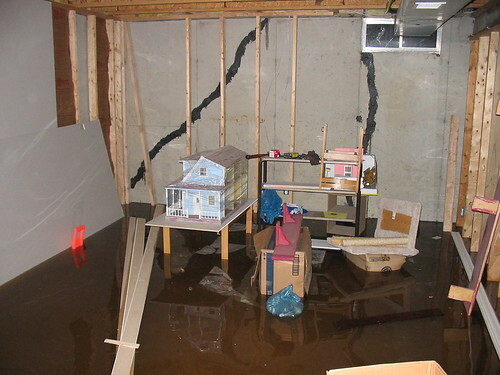 I was going along great from Thursday all the way until Sunday (Mother’s Day) We came home from being out for about 5 hours to find the basement had taken on 7” of water it actually crested while I was trying to come up with solutions at 8”. This room is my new office that I just had someone finish mudding and priming for me on that Thursday, plans were to paint in there this weekend. Fortunatly my neighbor, his kids and some of their friends came over and started to help bail the basement out with buckets until another friend showed up with an extra utility pump which we got hooked up and going. I was up unitl around 3 AM and by 7 AM the next morning my sump pump had removed the rest of the water and the basement was completely dry. 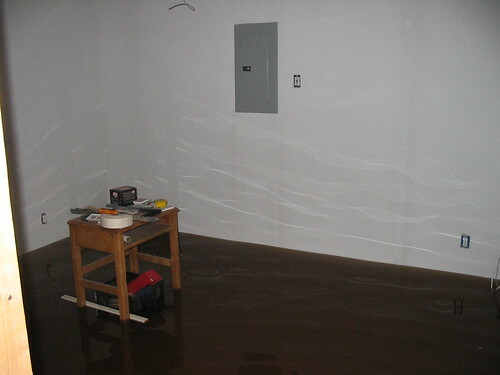 We had ServiceMaster coem out and set up fans and dehumidifiers. I wound up losing a foot of drywall and peg board around the entire perimeter of the basement. 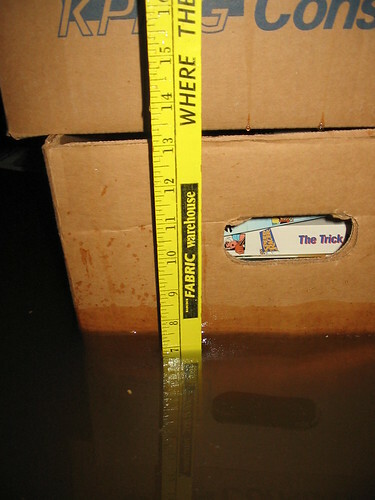 Since I had that smaller flood the week before there was not much left sitting on the floor. That box of videos you see in one of the pics and some books which I am hoping to salvage. and of course the drywall work looks like most of the wood (mostly scrap anyway) should be fine with having the driers going, I was able to get the humidity back down to 65% over the course of three days. Oh Man So Sorry to see that happen …..good luck with your shop …. -- Mike in Bonney Lake " If you are real real real good your whole life, You 'll be buried in a curly maple coffin when you die." We all feel you pain and hope you are back up and running shortly. But I think that Tom has asked some important questions. If there is any chance of it happening again that should be addressed. Man, I know your pain. When hurricane Agnes came thru this area in 1972, We had 4-5 FEET of water in our basement! 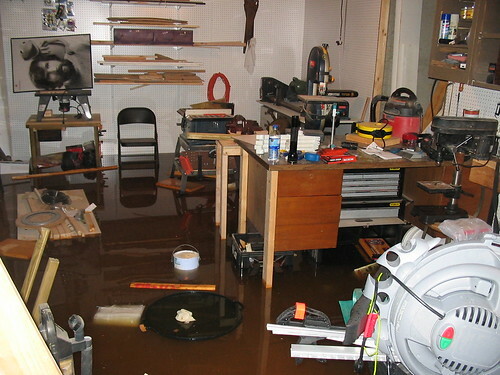 Now every time we get a hard winter or major rains, I lay awake at nite picturing power tools, workbenches and wood floating every where. Hope everything is getting back to normal. Hey all, Thanks. We are hoping the fact that Verizon is repairing the french drain in my front yard that they buried their FIOS cable through about three weeks ago fixes the problem. They are due out here early next week to dig it up and make repairs. I warned the digging crew about the drains in the yard and they were digging near them but it seems they instead went right through them.